Serve up the final course in style with the VonShef Square Cheese Board and Knife Set. Perfect for the cheese connoisseur, this beautiful set is great for parties and entertaining, creating a stunning centerpiece on any dinner table. 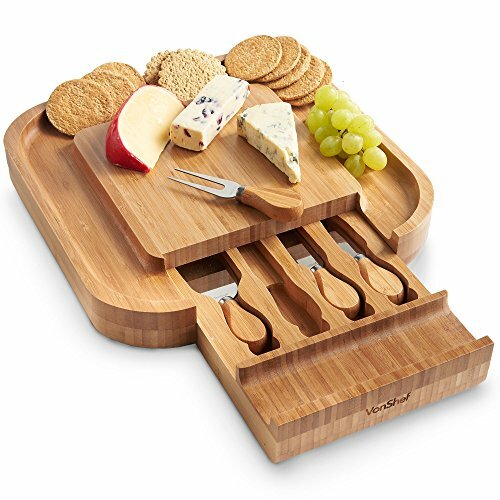 Made from sustainable and eco-friendly 100% bamboo wood, the cheese board is classically stylish and built to stand the test of time. Thanks to a large cracker serving border, you won't need to serve up cheese and crackers separately, and there's plenty of room for all your favorite varieties. Designed with a concealed slide out tray, which stores the specialist cheese tools neatly until you need to use them. Set comprises Stilton knife, cheddar knife, hard cheese knife and cheese fork - all with strong stainless steel blades and smooth bamboo handles. A great gift for any cheese lover. Food grade safe (LFGB & FDA approved). Board size: 13 (L) x 13 (W) x 2 (H) (approx.). PERFECT GIFT IDEA - A great birthday or housewarming gift for any cheese lover!